It is not safe at all for a couple of reasons. Firstly, for the 50% Equities : 50% Bonds example the Rule resulted in one not running out of money in ‘only’ 96% of cases. Not so great if you followed it religiously and was one of the 4% who ended up living under a railway arch. Secondly, it’s based on backtesting of history and we all know history is no predictor of the future. It is only based on a 30 year retirement period. That’s probably fine if you’re retiring at more typical ages such as in your 60’s or 70’s but probably not so relevant if your thinking of FIRE’ing in your 30’s or 40’s. It is US focused with the Equities and Bonds used plus place of residence of the retiree being US based. Quite a leap if you’re FIRE’ing in the UK. Also quite a leap if you’re a FIRE’ee who owns a more diversified portfolio of assets covering multiple countries. 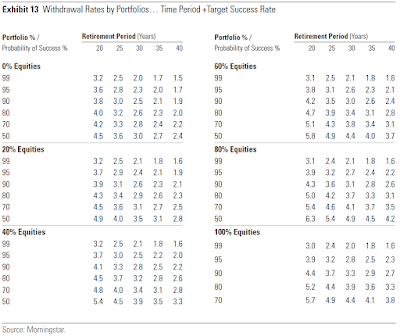 Considered some portfolio diversification with 50% Global Equities : 50% Global Bonds portfolio where for 100% ‘success’ that 3.0% Rule improved to become the 3.2% Rule. It was this work that helped me settle on an initial FIRE withdrawal rate of 2.5% having considered an increased retirement period than the assumed 30 years, inclusion of investing expenses and increased portfolio diversification. Building annual expenses/fees of 1% into the simulation. Considering retirement periods of up to 40 years so more relevant for early FIRE’ees. Considering various Equity to Bond allocation percentages. Considering various probability of success percentages. Considering a UK based retiree but with more portfolio diversification. For example the 60% Equity retiree considered has 25% UK Equities, 30% International Equities, 5% UK Direct Property, 10% Global Bonds, 13% UK Government Bonds, 10% UK Corporate Bonds and 7% Cash. The question then becomes based on this research is my 2.5% starting FIRE withdrawal rate still prudent? 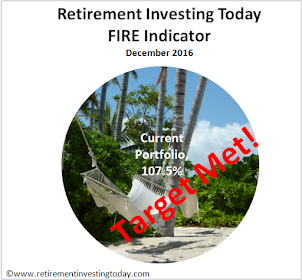 My planned FIRE portfolio is closest to a 60% Equities : 40% Bonds portfolio in the research. I also want a high probability of success so will use 99% from the research and given I’ll be FIRE’d at 45 years of age will use the longest period available in the research which is 40 years. Reading the withdrawal rate from Exhibit 13 says I should therefore be following the 1.6% Rule. Now that is a long way from either the 4% Rule or my 2.5% and would mean that for a desired first year withdrawal of £20,000 (including taxes) wealth of £1,250,000 would be required. Before I panic let me first play one trump card that I have over the research assumptions. I continuously treat both product (fund or ETF) and wrapper (Trading Account, ISA, SIPP) expenses as the enemy meaning my expenses in FIRE will be more like 0.25% rather than the 1% considered in the study. That pushes that 1.6% to a more palatable 2.35%. Given that the one failing no study can account for is that the future won’t be like the past I’m happy to stay with my 2.5% given its closeness to 2.35% and just track progress. I’ll then make spending adjustments on the fly in FIRE if they become necessary. Has anybody done any similar sums taking into account the state pension that we are (at the moment) promised ? 2. Assume full index linked State Pension of £8,296 and want to spend £20,000 per year with a withdrawal rate of 2.5%. Wealth required = (£20,000-£8,296)/2.5% = £468,160. Of course if you're going to retire before State Pension age it then gets a little more complicated. To calculate the wealth required then I'd just break the Retirement Period into two. So let's say one intends to retire at 48 with an assumed retirement period of 40 years and a State pension age of 68. Period one would be real spending of £20,000 for 20 years and period two would be real spending of (£20,000-£8,296) for 20 years. Historic sequence of returns might make this strategy a little more conservative as you have less time for markets to recover but then you're going to be needing a lot less wealth anyway because of the State Pension itself. Do any other readers have a better idea? Full disclosure: I haven't given it a lot of thought previously as I assume no State Pension in all my modelling. I recently found a good article explaining how to calculate the impact of state pension on the SWR. It covers total length of retirement and how many years into retirement before you expect to start taking a state pension. Also varying amounts of state pension based on initial pot size (which means it can be applied to DB pensions etc). Part 4 on the site covers the same topic but not in as much detail. At 2-2.5% you are effectively living within the "yield shield", in other words the passive interest/dividend/rent/royalty income *should* cover your cost of living. That is more prudent to my simple mind than running a plan that by design eats away at an early retiree's capital. It is just a shame the tax rules favour capital gains over income, as that encourages a "safe withdrawal" based approach at whatever rate that lets the retiree sleep at night. Good point Slow Dad. That is exactly my plan. The natural yield of my portfolio after netting off my home purchase is 3% against a planned withdrawal rate of 2.5%. "It is just a shame the tax rules favour capital gains over income, as that encourages a "safe withdrawal" based approach at whatever rate that lets the retiree sleep at night." I don't understand this statement. How could you live off capital gains without taking any as income? Could someone explain what you mean by this, perhaps with some figures for my ease of understanding? RIT, thanks for sharing. This is very interesting. But I have to say I found the Morningstar research very lacking. The analysis they have performed contains many hidden or unreasoned assumptions. It's difficult to know what I should take away from the calculated success rates. For example, it doesn't say how success has been determined, what return distributions have been used, the reasons for the returns and variances used. 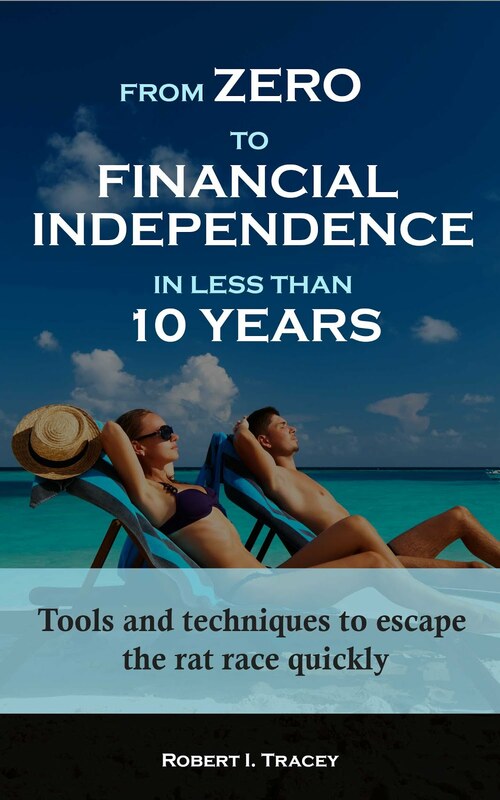 The authors ask:"How should retirees and financial advisers use this research?" Without being a sour puss I'd say to ignore it. (p.s. Please don't take this as criticism of your own analysis which is helpful for thinking about the factors that affect UK SWR and has been a useful guide to me). I agree that all of these papers are lacking in some detail, particularly around assumptions. The original 4% Rule papers were the same. That said I do find them helpful from a directionality perspective but it's also why I build so many of my own datasets. Building them allows you to understand all of the assumptions but also really helps you interpret the output as well. - "how success has been determined". I interpreted this as portfolio extinction is a failure so provided you have >=£0 left at the end of the Retirement Period you're successful. I made that assumption from Exhibit 1 and 2 but you're right that they don't say this is carried through the paper. Why do I say this? Running Exhibit 1 through cFIREsim shows <$0 after 30 years only from starting years 1964 to 1969 which matches the Exhibit. - "what return distributions have been used, the reasons for the returns and variances". Re-reading the paper I assume they've used the returns and variances from Exhibit 9. I agree this is not great. Actually, it's more than not great particularly as you highlight they don't state the reasons. A more appropriate analysis would have been to use historic sequence of returns like cFIREsim, FIRECalc or the original Bengen 4% Rule work do. I'm now wondering why they wouldn't do this and my spidey senses are now twitching. Thanks for jumping in here Elef. In reading the paper the first time I didn't quite absorb what they'd done. Thanks for the response RIT. I think you get the key to why I'm skeptical. There are limitations to cFIRE etc. but it is much easier to see them. The big alarm bell for me was the forward returns projection. If it uses a normal distribution then we know that this analysis will be fatally flawed. As we saw in the financial crisis returns do not follow a normal distribution and it is precisely these "shocks" that can make or break a successful retirement. I know historical back testing isn't perfect, but it is grounded in a stronger reality. The other point, on portfolio success is a more minor point. One of the things I don't like about most SWR analysis is it focuses on portfolio value rather than pure cash. Again, in the financial crisis we saw that lack of liquidity can happen well before portfolio extinction. That's why I've always found your conservatism on SWR to be appealing. RIT, as usual, an interesting and thought provoking post. A couple of observations - the Morningstar article assumes drawdown is adjusted for inflation (I assume UK). How would this vary if inflation is based on, say, Cyprus or Spain? I think your investment expenses are remarkable, I can't do so well myself. However, when commencing SIPP drawdown, these expenses definetely go up. For the first few years I'm going to assume I'm a UK investor spending £'s. It's one of the reasons I assumed what I thought (at the pre-Brexit time) was a relatively conservative GBP:EUR exchange rate of 1.123 and why I still look much like a UK investor portfolio wise. So I'll be adjusting a £'s drawdown for UK inflation and then converting at the prevailing exchange rate of the time. That is what I'll live off. I understand it will mean a varying amount of EUR's annually because of the exchange rate at the time effect but in actuality I don't think I'll be spending the full amount anyway unless I suddenly get flippant with my spending. That's because I think I had more than enough wealth back when I declared FI in July 2016 and I'm really running OMY because of Brexit (particularly healthcare concerns). I don't think the expenses will be so much greater in FIRE. Once I commence SIPP drawdown YouInvest will charge me £100 per annum and HL will charge me £0 so that's only 0.01%. Otherwise it's just infrequent trading costs to sell assets which should be no different to my infrequent trading costs to buy assets during my accrual phase. Have I missed something that you're aware of? I was thinking more about Inflation costs rather than exchange rate. If you are planning on increasing drawdown with inflation I would have thought the inflation rate you use would have to be that of the country where you live. Now considering the Morningstar study is based on UK inflation, a lower inflation rate in your country of residence would improve the drawdown figure given, and vice versa. Thanks for the clarification Borderer. I understand where you're coming from now. In the early years I'm going to keep myself a UK Investor even though I'll be a Spain/Cyprus and so I will limit my withdrawals to an amount in £'s with allowed increases in line with UK inflation. I do acknowledge it might (will?) lead to big annual fluctuations (both up and down) in EUR's but I'm prepared to accept that in the short term. I guess it's no different to somebody retiring to Spain on their UK DB pension when I think about it. Latest Mad Fientist podcast discusses safe withdrawal rates with Michael Kitces https://overcast.fm/+fC3B_I34 they seemed pretty comfortable with 4%. I guess you've also got to consider you'll have a fairly global portfolio and in UK you've not got to worry about high health insurance costs. Also isn't a 96% success only with a complete robotic application of 4% rule? I imagine just some minor adaptation to market conditions would push that success rate higher. I wonder how it looks if you drop to 3.5% during tough years. Or how about adding £100/week income for the few years of a market downturn? Don't forget the Mad Fientist and Micheael Kitces are US based with the US being one of the best (if not the best) countries for favourable withdrawal rates historically. It's one of the reasons for this post. - Of course dropping spending during a bad bear market is only possible if you are not already bare bones on expenses. I'm golden here with 47% of spending being discretionary but that said I also don't want to have to turn down a visit to friends/family because we're in a bear market. I want to FIRE with enough that it won't matter what Mr Market is doing and instead can live the quality of life we desire when we desire it. - When I FIRE I want work to be 100% optional. 5 years into FIRE I don't want to be thinking about whether my skills are still useful/saleable or whether I can get a bar job to pay for that weeks grocery shop. No thanks to that. That said I only want work to be optional so I could end up working again. Actually I'd say I will actually probably end up working again. It just might be periodically, for no monetary reward, something with far less stress and something that if the b*llshit bucket fills up I can just say thanks it's been fun. Of course this is just my view of FIRE and we all have a different view that works for us. From a quick scan of the morningstar report it appear they only ever analyse portfolios of single country. I suspect a even a slightly global focused portfolio is going to be more robust than a single country. The Pfau study above showed that when backtesting a 30 year UK retiree could have safely increased withdrawal rates from 3.0% to 3.2% by going from a domestic to a global portfolio. So your suspicion is true historically. The future is a different question of course. The Morningstar study does assume some global elements. As I mentioned in the post the 60% Equity example has 30% International Equities and 10% Global Bonds. "a 30 year UK retiree could have safely increased withdrawal rates from 3.0% to 3.2%": everyone already knows that the SWR is easy as pie. 3.14%. A bit confusing for the paper to factor in expenses/fees, since these vary so enormously. A range of 0.2% to 1.2% probably easy caters for 2 standard deviations. A big difference when we are talking about 2.5%-4% SWR. And my understanding is the 4% rule is before expenses/fees. So I look at that chart with 1% added to all numbers. In my case then 2.8-3.2%, bang on what I am planning for. Thank you for showing this. I think people should do a scenario analysis, combining SWR with the distribution of mortality data. All too often people use the 'date I will die' calculators which say that for a man aged 55 in the UK typical age at death is 85, so they look in great depth at a 30 year scenario, ignoring the fact that the range of ages of death is wide (see https://understandinguncertainty.org/why-life-expectancy-misleading-summary-survival for a nice chart). If you combined both datasets, you'd get find the probability of living unusually long and having unusually poor returns is much less likely than each individually. You make a very important point vicarage. I've added an image at the bottom of the post which I took from the MMM forums some time ago. It shows just what I think you are talking about. It was a bit of an extreme example (100% US equities and remember is US based) but combines a drawdown example with expected mortality. It traces a 45 year old US male (I think it was a male from memory) and nicely shows that even with a 5% historic WR rate you're always more likely to be dead than broke. Very sobering and one reason why my OMY was a very seriously considered decision. I like the graphic, especially when you consider you'll be following a trajectory through the space, so could be broke for many years, or tracking close to it and moving away due to the vagaries of the market. The NHS measure healthy lifespan, we could measure a wealthy lifespan, and as some people accept a shorter life in return for the pleasures of cigarettes and booze, others might accept penury later for the highlife now. But you must bear in mind that you're investing for your family, so don't look at the male figures, but the females. I do find the SWR discussion interesting academically, and found it useful when planning my escape from the office. I escaped very early indeed, although I'm not fully FI. Anyway, the point I wanted to make is that if you are retiring sub-60, it is extremely likely that you will have the skills, talent and interest to earn additional money. Even just the odd things like for instance getting £50 cashback on switching your electricity bills, or in RIT's case perhaps selling some books. Using the usual logic in reverse, if you find various ways to earn just £250 a month (or indeed save it from your usual budget), then at 2.5% SWR then that's equivalent to an extra £120,000 of capital. Selling things on ebay, selling photos, just not spending the £100 you thought you were going to and had budgeted for, it all really adds up and (for me at least) blows away any real concern about SWR's. I do appreciate that side income isn't something you'd necessarily want to completely bank on, and also that one might feel that scraping extra money is not something you want to do in retirement. Nevertheless, remember you'll have an awful lot more time on your hands and I'd wager that you find you earn way more than you think in retirement. One question - I'm surprised people's investing fees are as high as 1%. I use halifax sharedealing @ £12.50 a year, and the usual vanguard funds which have circa 0.25% fees. Perhaps a topic for another day, but are there particular platforms/funds/assets that are worth paying 4x more for? Genuine question as I'd be interested to know if I'm missing something important. I don't think there are platforms worth paying more for. I actually have a very competitive work-sponsored SIPP (30bps covering platform and fund managent charges) as long as you stick to the "basic" line of funds. However if you want to invest in shares/ETFs etc you get charged an annual fee plus the 30bps platform fee. So I stick to the basic funds and then when the pot reached critical mass, did a partial SIPP transfer to HL to invest via ETFs and pay only an effective platform fee of 10bps. I can't think of anything that would have encouraged me to invest in a platform with higher fees. Call it timing the market, but my view of prospective returns from here is much lower than historic averages (good Buttonwood article in this week's Economist about some research by GMO on this subject - including their forecasting track record). 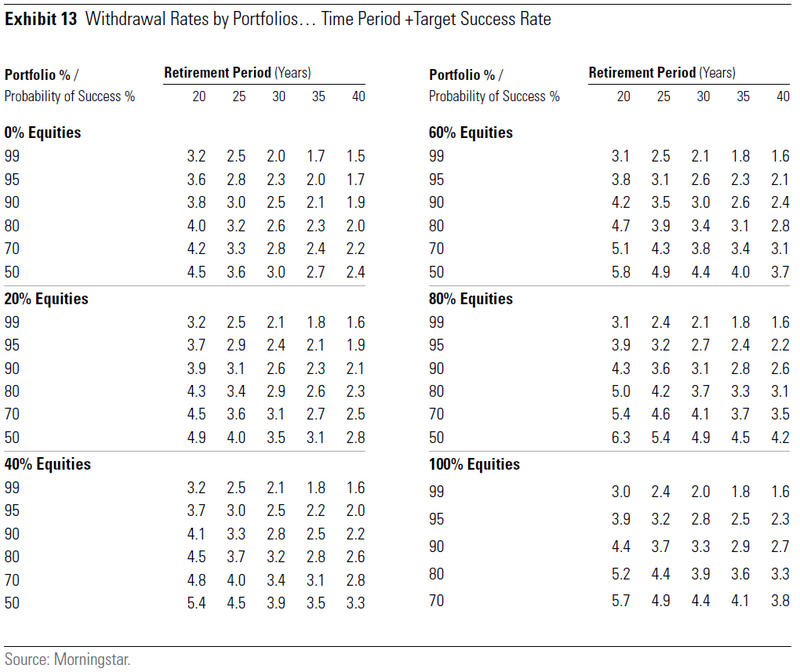 For instance GMO are forecasting -4% real returns over the next 7 years on US large equities. I love @Slow Dad's term yield shield and I shall adopt it from now on. My strategy is to set withdrawal rate to my prospective view of real returns of 2.5% along with a yield shield to guard against sequence of returns. This means if I was withdrawing today, in current market conditions, I'd actually be reinvesting my yield shield, building up an even greater buffer against future dividend cuts. I thought that the diagrams on pp 6 and 7 here are quite revealing. What makes investing so difficult at the moment is that even 1.7% maybe better the return on bonds. Though given the volatility that will come with it perhaps a bigger allocation to bonds is justified. I've been looking at US tips - as offer sligtly better yield than IL gilts, but was a bit worried about the currency exposure. I suppose over the long term purchasing power parity should take care of it! I've thought about TIPS too. They could be viewed as a gamble on UK inflation staying low, US inflation soaring, and the US govt choosing not to default. Not a very likely combination I'd have thought. But they probably are more usefully a gamble on much of the advanced world having higher inflation than now, so that it's a secondary question which government's loans you hold. But maybe the likeliest scenario is pronounced deflation before there's much chance of substantial inflation again. At least I understand why TIPS yield handily more than ILGs. Regulation has led to British pension funds plumping for ILGs to offset their liabilities for IL pensions. So the prices are kept high and real yields low. 'Low' as in negative, 'low' as in quiet whistle and muttering 'look at that'. The US market doesn't have this distortion. The assumption that you would continue to spend at the same (inflation adjusted) rate, right into penury is not just suboptimal, it's also unrealistic. I won The Accumulator over with this argument on monevator. I'm not talking about turning down trips because you're heading to zero. I'm talking about slight adjustments every year. With a 2.5% withdrawal rate, after 20 years you'll probably find yourself with far too much money and need to revise upwards, IMO. Good article. I think that whether you use 2, 3 or 4% it doesn't make a big difference. It's the journey not the destination. As mentioned elsewhere, this totally ignores any sporadic income that you could earn over the future years. RIT - aren't you looking at spending around £300k or so on a holiday villa in Malta (maybe the plan has changed). Anyway, it doesn't take much imagination to think that you could make some money from that - even if it's just bottling your own olive oil. Making some money from a passion - like photography, handcrafts or whatever is the way to go IMHO. Interesting as always! I am targeting to live just off the yield, and not have to sell anything in my retirement, ideally being able to reinvest a bit more to allow my lifestyle to inflate a little. As others above say, you can tweak things during retirement if things go bad, and that is when it becomes more important to have a cash buffer (something right now I am terrible at) to last a year or two (or more?). Right now my assumption is a natural yield of about 3% that I can draw down on, but I monitor my income generation and use that to tick off the boxes of how close I am! It's an interesting one this because as I get older my view has changed dramatically. I retire next year at 50 and to be fair my pot is excessively funded above my original expectations but this means 2 things. 1) I have not spent anywhere near what my earnings and I have been relatively frugal which is now easy for me and £25k a year (for Mr & Mrs) is enough whereas many earning what I do feel they 'need' @ £40k at the very least. 2) Any inherited wealth that may come is undesired and not required so will go straight to my children. With my children therefore helped by my own parents inheritance (rather than mine) I want to spend the majority of my assets before I hit 85....I would consider being 85 and broke as a privilege of a long life. Too many I know haven't made 70, some never made 40. It's not being melancholy but state pension plus say £5k would be enough. I do not seek a lifestyle in my eighties....only warmth, comfort and food. My parents are 85 now and civil service pensions plus their savings mean little to them now. Appreciate the state pension may have gone by then but if that's the case I will happy to be a government statistic not sat on £1m and be someone they can profit from. So my 50's I will live well, have genuine adventures whatever the cost but (as ever) won't buy things that I know I don't need. My 60's will be travel and a relaxing retirement. 70's relax and gentle travel. 80's relax and enjoy my memories. So 4% is my fair minimum in my 50's and I expect and want that to decline as I get older. Enough saving....now the pendulum swings the other way in my mentality and by attitude to what the risk really is. Nice strategy Phil321. I put a lot of thought into how I'm going to live once RE but have not yet reached my "final" conclusion. I very much agree that expenses will tone down drastically as I get older so that is part of my planning sheets. At such low withdrawal rates, you are probably better of (on a risk-adjusted basis) with a good chunk in annuities (to counter the risk of totally running out of money). "£25k a year (for Mr & Mrs) is enough": be careful. We budget for £27-£28k in a normal year. But those abnormalities keep arriving. But I definitely don't judge others spending as long as it isn't zombie spending. I know too many people who don't have cash, hate their existence, never have things they want and spend money on stuff they don't really want...probably costs them 10 years of their life. My brother needs £40k and year and he enjoys every single penny spent...fair enough. I need £25k but I own my home outright since I was 30 which helps. Also my holiday cash is outside this £25k ie I have enough for all my holiday and travel set aside...but that is because I expect that spend to be substantial ie Kilimanjaro, Amazon treks, US road trips...all on a fun type budget but a fair old expense non the less. I think the only truly safe withdrawal rate is zero, if SWR involves selling down assets. Why? Because living off capital realisations involves selling more units in a downturn, meaning that an enduring recession creates a depletion of assets that may be irretrievable. Much better to live off the natural yield of a diversified equity portfolio. Better still for that portfolio to consist of investment trusts, since many carry sizeable distribution reserves, meaning that they may cut their dividends much less sharply in difficult times than individual stocks. The only issue then is to choose ITs that you believe will increase their distributions at least as fast as inflation (or, more accurately, your cost of living - which may rise faster or slower). The younger you are, the stronger the case for sacrificing yield today for growth (in payouts, not necessarily capital) tomorrow. I've just written an investment report for a well known publisher in the sector that has two income portfolios based on ITs. One, for early retirees, raised its payouts something like 12-13 percent a year over the past decade - despite the global financial crisis. The other, for mainstream retirement ages, achieved about half that. The difference in yield is considerable - from memory, something like 2.9 vs 3.8 percent. BTW, I wouldn't go near bonds in the current environment. The yield premium over equities just isn't there. If you keep some cash in reserve in case equities cut their distributions, the security of income that bonds bring isn't needed, and the price you pay for it is currently exorbitant, in my view. I'm with Anonymous on this. These Firecalc numbers are all just a bit too presumptive of leaving money behind, and needing the same income for life, even after 90. My parents are in their 80s now and spend way less than even in their late 70's. Can't even get insurance to go on holidays anymore, so spend is falling even further. I am looking to run a portfolio of ITs, for the income protection, at around 4% yield and essentially assume no capital drawdown. Add in a year of cash buffer in a building society to cover income shortfall in a downturn and I really can't see any chance of running out. £30k x 30 years would put me at 85, and a 4% yield off my £800k would give me more than £30k and short of economic melt down is it really likely that my capital would be gone too? And here is my other dilemma, do I take the £800k, or keep my defined benefit pension paying me £30k? Or go in between, and take £20k pension and a £265k lump sum? This decision is the crux of the safe withdrawal question. Can it be done, and even leave a lump sum behind, or is it better to take a DB pension and maybe top up from the lump sum associated? £30k or £800k? That seems like a poor offer and I would probably take the £30k depending on your age and when it kicks in. Reason is £30k is enough to live in forever. My pension (at 50) is £15k. It will be £20k at 60 if I stop paying in now ie that is the accrued value. My offer is £600k....but of course that is then untouchable until 55. So £600k at 55 or £15k per yr (index linked etc) from 50. Comparing apples and oranges and leaning to the £15k a year despite everything telling me to take the money. But it will mean by 55 I will have already taken 5 years ie £75k plus the pension will be £16k due to indexing....tricky. Am not sure I should limit myself to stocks & bonds. I currently have stocks (including investment trusts), cash & a small amount of gold. No bonds. The stocks are globally diversified. Last time I looked, it was over 80% overseas. The cash is split between GBP & SGD. Whilst leaving the capital untouched is at first sight an attractive concept, I don't see natural yield as a significant any form of protection. What if your yield is from a few banks, so it dries up when the next financial crisis arrives ? Or pharma companies, where your retirement hopefully exceeds the length of their drug patents, so the dividend is reliant on a flow of new blockbuster drugs ? I think one way is to to be prepared to vary your income. Capping the withdrawal rate at the lower of your SWR and (say) 3% of remaining assets should mean you never run out of money. Of course, your pension may shrink, but if you're not on the breadline, then some cut backs as you become too old to travel may work out. Different anonymous, I think, well, yes, relying on income from only a few banks and some pharmacy would indeed be folly. Anyone who does that is a fool, especially if it is their only income. Hence I said Investment Trusts, in my case ones with at least 50 years of history paying out dividends, mostly rising, and global passive funds, including some bonds, and also including some actual corporate bonds paying realistic ytm payouts, such as Tesco, Helical, Wasps, Burford all paying around 4-5% over the next 3-5 years. Many on here (including myself P321) have been frugal and are trying to avoid running out of money in our retirement years. Just been re-reading mine and others posts and I am increasingly changing my thoughts with the view that the real risk is at 85 if I am still sat on a SIPP carefully withdrawing money planning how much I need at 95. Many 'normals' are telling me (and probably many of you) to spend our money and 'enjoy life' almost as though spending is the only way you can enjoy yourself and they are wrong....I know that because as I retire at 50 I will look at their existence and know I have 15/20 years extra retirement and freedom than they do just because I went without bits of cr4p I didn't need. But here is the issue for me....being wealthy at 85 is equally a waste. I KNOW at that age I will not care if I have £1m or £10k....if I am lucky enough to live till 85 I want to look back and know I have maximised my time on this spinning rock hurtling through space. I guess at 85 I will be as fearless as those 'normals' we're at 35. I intend to smash my 50's and 60's with yest and enthusiasm. Okay, easy for me because I am a 'bad' spender anyway and we will still fly to Italy for £40 return and stay in fab little BnBs....but all I mean is whilst I will always be naturally frugal I am not restricting myself based on some withdrawal rate. Any large amounts of money left over at 85 will demonstrate a waste of my precious time earning it not a prize or demonstration of a successful plan. I know if I hang on until 55 my assets will increase by £500k....but I am out. The next 5 years are the best I will have in terms of youth, energy and ambition to enjoy. Enough gathering, it's time for me to let go of the accumulation and just relax. I know I am not 'right' because 'right' is what works for you. However, I am increasingly feeling a release of pressure and stress as I realise my time is finite and the biggest risk is I don't use that time well.